I am currently smack bang in the middle of my end of year break. Every December M & I go away, just the two of us (and the doggie). We don't take my teenage boys, this is our time. We are a blended family and believe it is extremely important to take some time out, sans children. 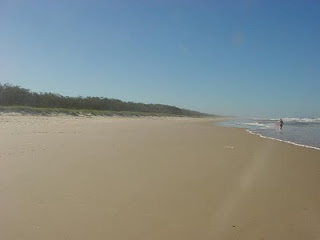 We stay just outside of Kingscliff in Northern NSW at Casuarina. It is quiet, peaceful, and so relaxing. We always go before the Christmas Holiday rush to ensure we experience it at its most peaceful time. There are no large shopping centres, no malls, no theme parks ... nothing. Kingscliffe has a pub, a surf club, a few cafes, a few restaurants, some little speciality shops and, my favourite, a book shop. There is also a beach. A long, beautiful, quiet beach that stretches as far as the eye can see in both directions. We sleep in, we stay in our pyjamas until lunch time, we have morning sleeps, afternoon sleeps and sleeps whenever we want to. We walk on the beach every day, this year we've even started running on the beach. We don't look at the clock, we don't care about time. We watch daytime television, we buy the Women's Weekly, I read it to get in the mood for Christmas, M does the puzzles. I usually bring 4 or 5 books, M brings 1 or 2. We read. We read some more and then when we are done we go to the bookshop and read some more. For us, it is the perfect way to end a busy working year and recharge our relationship. It is our little piece of heaven. What is your little piece of heaven? Oh Annie, this does sound like heaven. Especially with the rain. Reading in the rain on the beach sans kids. I think that's my heaven as well. Enjoy your well-deserved break! Sounds spectacular Annie! Insanely jealous here. Unfortunately with small people in the house there's no chance of hubby and I getting away alone. Oooh lovely! That is indeed a beautiful part of the country. Funnily enough, I'd surely have to agree: reading at the rainy beach sans kids sounds like absolute unwind Heaven. OK....this sounds insanely PERFECT!!! SO many people come back from a holiday & say they need a vacation to recover from their vacation :) I think you have mastered the most blissful, relaxing, PERFECT holiday! LOVE IT! P.S. I love that bookstore in Kingscliff too! Annie this sounds blissful. Right now Husband and I can't block time away together because of family but this Sunday we are going out to breakfast and lunch just the two of us. It will be an extended date. Can't wait. I think your little piece of heaven could easily be my little piece of heaven too! Wish I was there! Love your new look! Oh, I could get into some or all of this! I would definitely take the sleeping all day aspect. And the reading. Right now I read whatever paperback I can manage in one hand whilst I feed the baby ... who is also the reason that the sleep part of your holiday sounds so good! Enjoy! Being a mother having a great taste of life. Get college essay help here from me. I love to provide student help.